Which 510 hp Jaguar Would You Buy for Under $35k? So an interesting thing is happening. 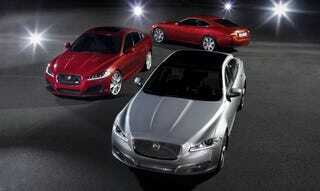 Model Year 2011 and 2012 Jaguar XFR, XKR Coupes, and XJL Supersports are all gathering around the $35k mark. All three of these Jaaags use the same 510 hp supercharged 5.0L V8. This means that within the next two years the XKR Convertibles and SWB XJ Supersports will all be at the same price points leaving us with 5 different variations of same model and same 510hp powertrain Jaguars available for under $35k in great condition. My question is, for less than the price of a 200hp Volkswagen CC, which would you go for? I also want to point out that these particular models are stylistically sleepers when compared to their R-S variants, which is why I love them so much! All models are pretty much between 4,000-4600lbs, get around 15/22 mpg, and have 0-60mph times in the mid 4 second range. So it’s almost a bodystyle choice than anything else.